And now Carrie Fischer. Princess Leia to Star Wars fans. She was just 60. I dont know if 2016 has been worse than other years for celebrity deaths – it feels worse. Maybe because those that have left us are so much more connected with our lives through the last four decades of global communication and the globalisation of our culture – at least in the entertainment industries. The generations of middle-aged people along with all their children and grandchildren have experienced a kind of collectivisation of childhood. This was a historic shift. Before the mass media, childhood memories were shared among very small groups, and anchored to particular places. But for the last 60 years, children in the west, and increasingly elsewhere, have grown up in front of televisions, and many of the most vivid characters of their childhood and adolescence were actors or singers. The entertainment industry has largely replaced religious ritual in many lives, and has itself grown more ritualised, and even religious, in the process. Farewell George Michael, passed away at just 53. He was Wham in the 1980s and was truly established as a solo star until his death. Like so many people of extra-ordinary talent he had his flaws. But by all accounts he was also hugely generous. Careless Whisper was the song when I was working in Australia in 1984. But after that I spent so little time in England that I really did not follow his career or music. The huge out-pouring of sadness and goodwill in the UK this morning shows the impact that he made. He was hounded and pilloried by the media – especially Murdoch’s rags. Now watch then portray him as a musical icon. They should (but wont) be ashamed. “If we want to pay tribute to George Michael today I think our response should be visceral, heartfelt, rebellious: let’s congregate outside Hampstead Snappy Snaps. Let’s perform lewd acts in Beverly Hills parks, cavort on Hampstead Heath, stuff shuttlecocks down our shorts. And if all of that fails let us do this: grab the person you love and tell them how much you relish them, love them, desire them. Maybe avoid flying to Abuja in early 2017 as Abuja airport will be closed for six weeks from February 2017 for runway repairs. All flights will be diverted to Kaduna airport, 188 kilometres away. Kaduna has a 3000 metre ILS CAT II VOR/DME runway 05/23 but with few scheduled flights. The stretch of road between Kaduna and Abuja is a three-hour journey and is known to be dangerous. The Nigerian federal government will fund shuttle buses and the Abuja state government has agreed to provide security. Emirates has already suspended flights to Abuja – they are unlikely to be reinstated soon. The current EK passenger fleet: the Dubai-based carrier’s mainline passenger fleet currently consists of eighty-eight A380-800s, ten B777-200(LR)s, ten B777-300s, and 125 B777-300(ER)s.
Twelve people are confirmed to have died after a truck ploughed into a crowded Christmas market at Berlin’s Breitscheidplatz at around 8pm on Monday evening. A further 48 people have been taken to hospital with injuries, some of them serious. Eyewitnesses said the truck drove into the market at speed, crushing visitors. A suspect was arrested 2km from the scene and is being interrogated. No details of his identity have been released. Officials have not confirmed a motive for the deadly incident, but a statement from the White House said it “appears to have been a terrorist attack”. US president-elect Donald Trump called it a “horrifying terror attack”, blaming “Isis and other Islamist terrorists [who] continually slaughter Christians in their communities and places of worship”. But Germany’s interior minister, Thomas de Maizière, urged caution: I don’t want to use the word ‘attack’ yet at the moment, although a lot speaks for it. There is a psychological effect in the whole country of the choice of words here, and we want to be very, very cautious and operate close to the actual investigation results, not with speculation. The US state department issued a warning in November for travellers in Europe of a heightened risk of terror attacks at Christmas-related events, including markets, by Isis, al-Qaida and affiliates. Thought as always are with the families and friends of anyone caught up in this senseless attack. Apparently Sir Tim Clark has informed senior management of his departure from Emirates in min-2017, and his family have made friends aware, that they are all leaving Dubai in June. OK. This is from a rumour site – but seems likely given the other changes in the airline. It is time to start looking back on 2016 – personal and global. Let’s start with the most unexpected sporting achievement of the year, of the decade of…well you get the picture. Leicester City won the 2015/2016 Premiership – which led to an eve more unexpected celebration! To be honest. Wonderful. Am not sure that the Leicester faithful know quite what to make of it. They might prefer Spice Girls to Bocelli. This was personal to Ranieri – who looks a bit upset at the chanting crowd. Wonderful. So room rate plus 20 per cent plus aed15. On an aed500 room that is an extra aed115. Not cheap. When I took my PPL checkride in 2015 we flew into Tampa International – I was obviously just pioneering the approach for Emirates! Emirates Boeing 777-31HER A6-EGH operating EK219 Dubai – Orlando diverted via Tampa this afternoon due to weather at Orlando. The return EK220 subsequently operated using callsign EK220D. A rumour on PPRUNE that the GCAA just sacked the chief air accident investigator who was the IIC for the UPS accident, was at Rostov for flydubai and Dubai for the EK accident and is arguably the most competent investigator in the dept if not the entire region? No a good sign for the EK521 investigation. Meanwhile on EK521 “there will be many lessons to be learnt from this accident, not least of which will be Culture. National culture and Organisational culture will be the headline news I’m sure, but a lot will depend on what can and can’t be published ‘politically’. President Raul Castro announced at the weekend that Cuba will prohibit the naming of streets and monuments after his brother Fidel, and bar the construction of statues of the former leader and revolutionary icon in keeping with his desire to avoid a cult of personality. “The leader of the revolution rejected any manifestation of a cult of personality…insisting that, once dead, his name and likeness would never be used on institutions, streets, parks or other public sites, and that busts, statutes or other forms of tribute would never be erected,” Raul Castro told a massive crowd gathered in the eastern city of Santiago. The Crown Prince and his family left Munich yesterday afternoon to return to Bangkok. I wonder when he will return to Germany. 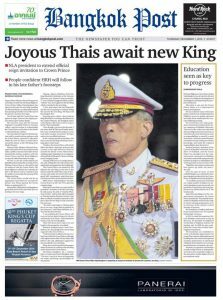 My guess is that his sisters will be left to do most of the day-to-day ceremonial work in Thailand.